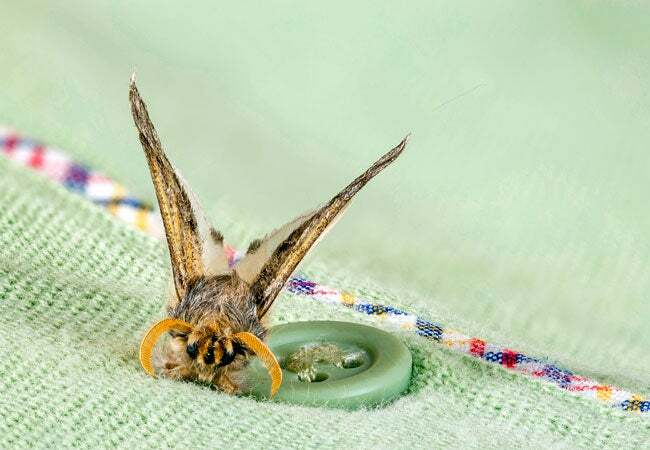 Banish moths in the closet and treat damaged fabrics with these low-effort solutions. Q: I recently took my favorite sweater off of its hanger only to discover small holes in its knitting. Could this mean I have moths in the closet? And, if so, how do I get rid of them? A: Your wardrobe woes probably stem from an infestation of clothes moths, either of the yellow-colored “webbing” species or the brown speckled “casemaking” species. These nocturnal insects crave the dark and confined space of a closet. After entering through cracks in walls or crevices beneath closet doors, they lay eggs on clothes, linens, and other fabrics stored inside. 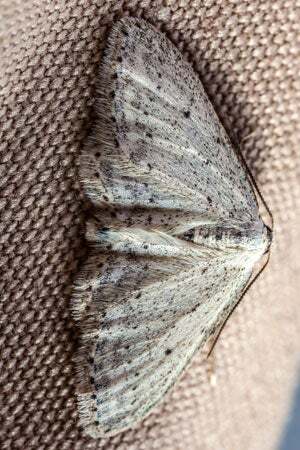 Adult moths and eggs don’t damage the items; however, hatched eggs (or larvae) feed on animal-based fabrics like silk, wool, cashmere, and fur. They’re also partial to fabrics made from a blend of animal and synthetic or cotton fibers. The result is a collection of holes on your favorite sweaters, blouses, and jackets. If ignored, clothes moth larvae progress to the pupae stage, and homeowners may find their husk-like, tube-shaped cocoons (or casings) on clothes. The larvae eventually emerge as winged adults and continue the cycle of laying eggs and unraveling your wardrobe. Want to eliminate the infestation? The best course of action depends on the scale of damage. Read on to learn how to identify and treat moth damage, and find out how to get rid of moths in the closet for good. Confirm the infestation. Use a flashlight to inspect clothes (especially seams, cuffs, and collars), linens, and other fabrics stored in the closet. Search each item for randomly placed holes; these may range in size from small and round to large and irregularly shaped. Also scan the closet for adult moths, which are cream-colored to silver-brown with a quarter- to half-inch wingspan. Homeowners may also find pupae cocoons or casings, larvae (which look like white caterpillars), or eggs (which resemble cream-colored globes). Still unsure if you have a moth infestation? Buy some adhesive-lined moth traps, available for $10 to $15 at home centers, and place them in the closet; the artificial pheromones inside will lure and trap any adult moths fluttering nearby. Bag and freeze individual moth-eaten items. If you find a single damaged or moth-ridden item in the closet, use a broom to brush any visible moth remains into a dustpan. Immediately dispose of the remains outside, then remove the affected fabric from the closet. If it’s still salvageable, seal it in a Ziplock bag and store it in your freezer for 24 hours. The extreme cold will kill any active larvae. When a day passes, retrieve the item from the fridge, but leave it bagged until you’re ready to clean it (use the tips that follow to clean moth-eaten fabrics). De-bug the closet if you spot widespread wardrobe damage. Did you find moth holes or remains on multiple items? Then retrieve all clothes and fabrics (even those without visible damage) from the closet. Place salvageable pieces in a trash bag and seal it with twist ties until ready for cleaning. Likewise, move furnishings from the closet onto a tarp outside the room. Use a vacuum cleaner to eliminate moth remains from the closet floor, walls, and built-in shelves or rods. After you’re done, grab an old paintbrush and an odorless insecticide formulated with the active ingredient pyrethrum, chlorpyrifos, allethrin, or permethrin, such as Delta Dust Insecticide. Apply the solution to closet wall cracks or crevices, shelf and baseboard edges, and below loose carpeting to kill any moths in the closet that land on these spots in the future. Run machine washable fabrics through a hot water cycle. Whether you discovered isolated or widespread damage, washing the affected fabrics in hot water is the best way to kill moths at all life stages. Check that the item’s care label recommends machine washing. If so, run the garment in a hot water cycle at a minimum temperature of 120 degrees Fahrenheit for at least 20 minutes. Then machine-dry the garments at the hottest recommended temperature setting for at least 30 minutes. Shake out the dry item to loosen any trapped moth casings or cocoons, sweep these remains into a dustpan, and dispose of them outside. Dry clean non-machine washable fabrics. Some fabrics, such as delicates made of silk or wool, aren’t machine washable. In this case, dry clean the items at the hottest temperature setting recommended by the care label. This will kill moths in their egg, larvae, and pupae stages. Shake out the item to draw out any trapped moth casings or cocoons, then sweep these up and dispose of them outside. Spray insecticide on oversized articles. Now it’s time to deal with items too large to machine wash or dry clean, such as a closet floor rug. Spray a non-oil-based aerosol moth insecticide like Acana Carpet & Fabric Moth Killer in an inconspicuous location on the fabric. If no unwanted staining occurs, cover the rest of the fabric with the insecticide to kill moths on contact. Either mend or dispose of moth-eaten items. 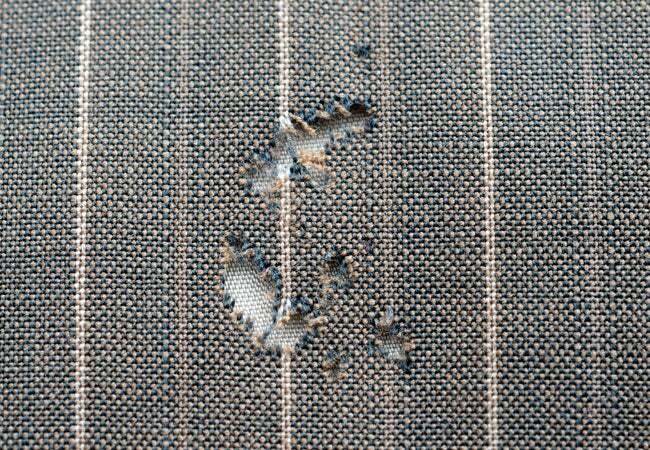 To restore salvageable moth-eaten fabrics, repair holes with a sewing machine and thread, then return the item to the closet. If the holes in the fabric are too large or numerous to be repaired, discard the item in a trash bag sealed with twist ties. Immediately dispose of the trash bag outside. • Vacuum your wardrobe’s floors and shelves weekly to eliminate dust, which attracts moths to the closet in the first place. • Wipe down closet walls, baseboards, clothes rods, and shelves every few months with a soft cloth and all-purpose cleaner. • Store only clean and dry fabrics in the closet; moths are also attracted to the odors, oil, and moisture in fabrics that are soiled with food or grime. • Store out-of-season clothes and linens in airtight containers where moths can’t reach them. • Instead of stacking in-season clothes, hang them on clothing rods. Store suits and dresses in resealable garment bags. • Line storage containers, closet shelves, and dresser drawers with mothballs or small drawstring bags full of moth-repellent dried herbs, such as rosemary, lavender, or thyme. • Replace wood closet furnishings with cedar equivalents, since the natural oils of cedar are powerful enough to kill moth larvae. Also consider lining furniture drawers with hamster bedding made of cedar shavings. • Run any clothes or linens bought secondhand through a hot water wash cycle (or dry clean them) before storing in the closet.